We have prepared a CPD seminar providing detailed information for specifiers of industrial profiled rooflights for industrial building roof refurbishment applications. The seminar includes modules covering: Identification of existing materials; rooflight deterioration; solutions; and regulations. It has been designed to help the specifier identify the most appropriate materials and designs to replace failing rooflights and where applicable, to upgrade the specification of the rooflights to meet current legislation. In addition to these practical modules, the seminar also gives a brief history of profiled rooflights as well as outlining the generic benefits of natural daylighting – from reductions in energy consumption and emissions, to healthier and more beneficial internal environments. The duration of the presentation is approximately 45 minutes. 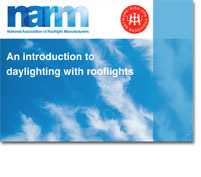 – the role of rooflights in energy saving and emissions reduction; Overview of rooflight systems & applications; Rooflighting design basics; Rooflighting legislation & standards. 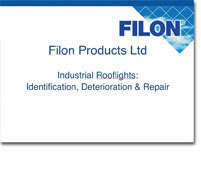 To arrange for a Filon technical specialist to deliver a presentation at the location of your choice, please email us or contact Mark Wilcox on 01543 687300.